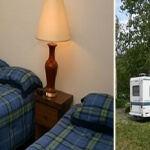 Cooper Landing is nestled in the majestic Kenai Mountains beside the beautiful turquoise waters of Kenai Lake, the Upper Kenai and Russian Rivers. 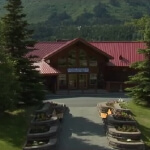 Cooper Landing is surrounded by the Chugach National Forest and the Kenai National Wildlife Refuge. 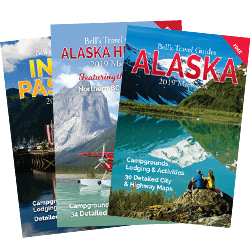 The area’s convergence of scenic mountains, rivers, well-maintained hiking trails, spectacular sport fishing and plentiful wildlife make it a favorite outdoor recreation destination for Alaskans and anyone looking for an adventure. The town, originally called Coopers Landing, is named after Joseph Cooper who arrived in 1884 to search for gold on the Russian River and Cooper Creek. The Kenai River itself served as the principal means of transportation until a road from Seward was built in 1938. Until then only the railroad connected Seward to Anchorage. 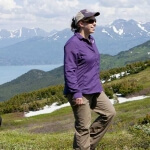 It was not until 1950, that the Sterling and Seward Highways connected the rest of the Kenai Peninsula to Anchorage. 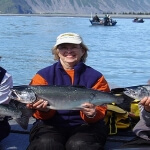 Cooper Landing is home to some of the best sport fishing in the world with readily accessible road access to the Upper Kenai and Russian Rivers. These rivers provide anglers with some of Alaska’s finest yet affordable sport fishing opportunities. The U.S. Fish & Wildlife’s “Russian River Ferry” at mile 55, crosses the Kenai River to allow bank-fishing anglers to access the Kenai & Russian Rivers Confluence, which is the most productive Sockeye (Red) Salmon sport fishery on earth. The area has seen human habitation as far back as 2000 BC when The Kachemak Riverine tribe established fish camps along the Rivers. The Dena’ina Athabaskan Indians arrived in the area about 1000 AD and dominated until just over a century ago. 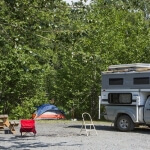 mile 50.5 USFS campground. Water, tables, fire pits and toilets.